Definition at line 26 of file CQCompartment.h. Definition at line 38 of file CQCompartment.cpp. References CModelEntity::ASSIGNMENT, CModelEntity::FIXED, FROM_UTF8, CQExpressionWidget::InitialExpression, mExpressionValid, mInitialExpressionValid, mItemToType, CModelEntity::ODE, CModelEntity::StatusName, and CQExpressionWidget::TransientExpression. Definition at line 76 of file CQCompartment.cpp. Definition at line 103 of file CQCompartment.cpp. References CModelExpansion::SetOfModelElements::addMetab(), CModelExpansion::SetOfModelElements::addObject(), CModelExpansion::SetOfModelElements::addReaction(), CQCompartmentCopyOptions::ALLREAC, CCopasiVector< T >::begin(), C_INVALID_INDEX, CQCompartmentCopyOptions::COMP, ListViews::COMPARTMENT, ListViews::DELETE, CModelExpansion::duplicate(), CCopasiVector< T >::end(), CModelExpansion::SetOfModelElements::fillDependencies(), CReactionInterface::getChemEqInterface(), CChemEqInterface::getCompartment(), CModelExpansion::ElementsMap::getDuplicateKey(), CModelEntity::getKey(), CCompartment::getMetabolites(), CCopasiDataModel::getModel(), CModel::getReactions(), CReactionInterface::initFromReaction(), CQCompartmentCopyOptions::INTREAC, CReactionInterface::isMulticompartment(), ListViews::METABOLITE, CopasiWidget::mKey, mpCompartment, CopasiWidget::mpDataModel, CopasiWidget::mpListView, CopasiWidget::mpObject, pdelete, CopasiWidget::protectedNotify(), ListViews::REACTION, CQCompartmentCopyOptions::SPECIES, and ListViews::switchToOtherWidget(). Definition at line 521 of file CQCompartment.cpp. Definition at line 330 of file CQCompartment.cpp. 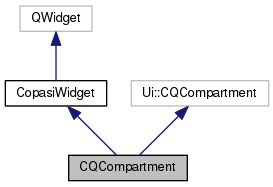 References load(), mpCompartment, and CopasiWidget::mpObject. Definition at line 339 of file CQCompartment.cpp. References CModelEntity::FIXED, mItemToType, and save(). Definition at line 380 of file CQCompartment.cpp. 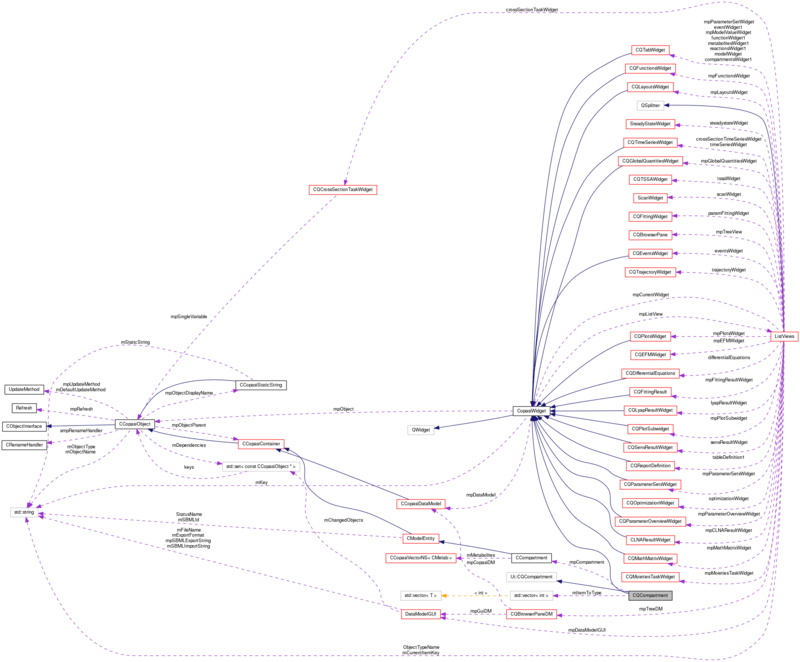 References CModelEntity::ASSIGNMENT, FROM_UTF8, CCopasiRootContainer::getDatamodelList(), CCompartment::getDimensionality(), CModelEntity::getExpression(), CModelEntity::getInitialExpression(), CModelEntity::getInitialValue(), CCopasiObject::getObjectAncestor(), CModelEntity::getRate(), CModelEntity::getStatus(), CModelEntity::getValue(), CModel::getVolumeRateUnitsDisplayString(), CModel::getVolumeUnitsDisplayString(), loadMetaboliteTable(), mChanged, mpCompartment, slotTypeChanged(), and CModelEntity::StatusName. Definition at line 548 of file CQCompartment.cpp. References FROM_UTF8, CCompartment::getMetabolites(), CCopasiContainer::getObjects(), mpCompartment, and CCopasiVector< T >::size(). Definition at line 457 of file CQCompartment.cpp. References CModelEntity::ASSIGNMENT, C_INT32, ListViews::CHANGE, ListViews::COMPARTMENT, CCopasiRootContainer::getDatamodelList(), CCompartment::getDimensionality(), CModelEntity::getExpression(), CModelEntity::getInitialExpression(), CModelEntity::getInitialValue(), CModelEntity::getStatus(), mChanged, mItemToType, CopasiWidget::mKey, mpCompartment, CopasiWidget::protectedNotify(), CCompartment::setDimensionality(), CModelEntity::setExpression(), CModelEntity::setInitialExpression(), CModelEntity::setInitialValue(), and CModelEntity::setStatus(). Definition at line 58 of file CQCompartment.h. Definition at line 196 of file CQCompartment.cpp. References ListViews::COMPARTMENT, CQMessageBox::confirmDelete(), ListViews::DELETE, FROM_UTF8, CCopasiRootContainer::getDatamodelList(), CCompartment::getDeletedObjects(), CCopasiDataModel::getModel(), CCopasiObject::getObjectName(), CopasiWidget::mKey, mpCompartment, CopasiWidget::protectedNotify(), and CModel::removeCompartment(). Definition at line 81 of file CQCompartment.cpp. References ListViews::ADD, C_INVALID_INDEX, ListViews::COMPARTMENT, CCopasiRootContainer::getDatamodelList(), CModelEntity::getKey(), leave(), mpCompartment, CopasiWidget::mpListView, CopasiWidget::protectedNotify(), ListViews::switchToOtherWidget(), and TO_UTF8. Definition at line 320 of file CQCompartment.cpp. Definition at line 325 of file CQCompartment.cpp. Definition at line 298 of file CQCompartment.cpp. Definition at line 524 of file CQCompartment.cpp. References C_INVALID_INDEX, CCompartment::getMetabolites(), CCopasiContainer::getObjects(), mpCompartment, CopasiWidget::mpListView, ListViews::switchToOtherWidget(), and TO_UTF8. If the simulation type is changed then COPASI will automatically adjust its appearance, especially correlating to the Expression Widget and its buttons. Definition at line 232 of file CQCompartment.cpp. References CModelEntity::ASSIGNMENT, CModelEntity::FIXED, FROM_UTF8, CCopasiObject::getObjectAncestor(), CModel::getVolumeRateUnitsDisplayString(), CModel::getVolumeUnitsDisplayString(), mItemToType, mpCompartment, CModelEntity::ODE, and slotInitialTypeChanged(). Definition at line 358 of file CQCompartment.cpp. References ListViews::COMPARTMENT, load(), ListViews::METABOLITE, CopasiWidget::mIgnoreUpdates, ListViews::MODEL, and ListViews::STATE. Definition at line 46 of file CQCompartment.h. Definition at line 47 of file CQCompartment.h. Referenced by CQCompartment(), and slotExpressionValid(). Definition at line 48 of file CQCompartment.h. Referenced by CQCompartment(), and slotInitialExpressionValid(). Definition at line 44 of file CQCompartment.h. Referenced by CQCompartment(), leave(), save(), slotInitialTypeChanged(), and slotTypeChanged(). Definition at line 45 of file CQCompartment.h. Referenced by copy(), enterProtected(), load(), loadMetaboliteTable(), save(), slotBtnDelete(), slotBtnNew(), slotMetaboliteTableCurrentChanged(), and slotTypeChanged().